If like me you’ve picked up a crispy slice made by a well known cereal company, eaten it and then thought afterwards it wasn’t that great then this is the slice for you. Personally I find the manufactured bar can be too sweet and compressed tightly to get it into the packet. The kids love them but they are hideously expensive to buy and if you have 2 children who like to eat them along with a husband who is partial to bringing them to work for a snack you could easily bankrupt yourself in no time trying to keep them in stock. This recipe makes a large tray of slices which should be enough to keep the family pleased for a week. They are so quick to make it’s a nice swift weekend project to make with the kids for their lunchboxes in the week ahead (if they are allowed small treats), also it means that you can cut them to your preferred size and so limit the amount of sugar your children eat. This week I got my supplies in Lidl, the packet of marshmallows combined with the own brand crisp rice, a drop of vanilla extract and a small amount of margarine means that the cost for the full tray is €3. I use margarine rather than butter in this recipe because the butter can overpower the flavour of the marshmallow but by all means use it if you prefer. The week past also marked a good friend’s birthday and they didn’t want a heavy cake. So I made a “cake” out of the crisp rice and coated it with warm chocolate ganache just before serving with piping hot coffee and tea. On a very low heat melt the margarine in a large saucepan. Line a baking tray well with cling film. Once melted, pour in the marshmallows and keep on stirring on a low heat until all have melted and there are no lumps. Stir in 1 teaspoon of vanilla extract. Pour in the crisp rice in thirds, stirring after adding each section so that they are completely covered with the marshmallow mixture. Once all the crisp rice has been stirred in and coated with the marshmallow remove from the heat and pour onto the lined baking tray. Spread the mixture over the baking tray and press down firmly. Cover with more cling film and leave in a cold place to cool. Slice with a sharp, wetted knife to stop it from sticking to the marshmallow slices. Slices will keep in a sealed box for up to a week, if they last that long! Do let me know how you get on Peggy. They are delicious! Thanks Shirley. Don’t forget to keep the leftover milk to one side for scones! Stupid question-but hoping to make them today-does it matter what type of marshmallow is used? Any type at all Róisín although coloured ones will give a coloured result! My ones were coloured Roisin just pink, white & yellow. I know someone who got blue/green ones and they tasted fine, if they looked a little strange! You could always add a small amount of food colouring to them to change the colour if they turn out looking odd. After all that’s what’s in them in the first place! Woah okay point taken Roisin I’ll amend the equipment list now. Thanks for the feedback & I hope they tasted nice! Kids love making & eating this treat. You don’t need to put them into slices by the way. You can also spoon into buncases for less mess! 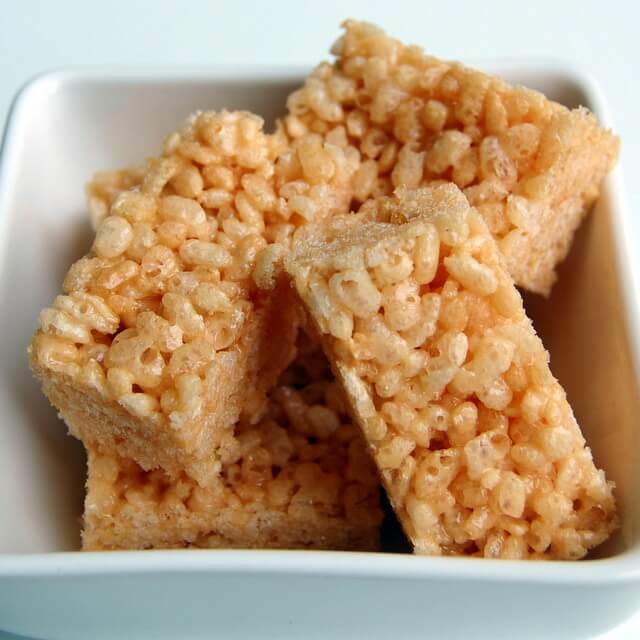 I made these this morning and they are a big hit with all 4 children, can I ask tho I found them a little sticky, would that mean I need to put in extra rice crispies? If you found them too sticky definitely add more rice crispies. The only thing I will say to you is that they lose their structure a bit if you put too many in. If you’re talking about when slicing use a mug of hot water to put your knife into before and after slicing the marshmallow slices. A little more butter can deaden the stickiness either. This recipe reminds me so much of my dear late Mum, she always made them when we came to visit when our children were little. I have made them also and have included some toffee sweets along with the marshmallows, they are yummy definitely better than the bought bars.